JEE Mains which is going to commence in the month of January 2019 for the academic year 2019-2020 will be conducted in online mode. According to the instructions of NTA (National Testing Agency) the entrance examination for B.Tech and B.Arch program application process has been started for the same. There will be a couple of changes in the exam pattern, though there is no need for the students to worry regarding the same. JEE Mains, conducted through both online and offline mode will now be conducted only through online mode. According to the news released by NTA, now the examination will not be conducted in pen and paper mode. JEE Main 2019 entire 1st Paper will be conducted in online mode, whereas Paper 2 will be partially conducted in online mode. 2nd Paper consists of 3 parts, namely Mathematics (Part I) and Aptitude Test (Part II) will be conducted through online mode and the Part III i.e., Drawing Test will be conducted through offline or pen and paper mode. 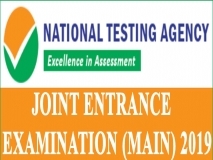 The Joint Entrance Examination will be conducted as scheduled by the admission authorities of NTA, i.e., from January 6th 2019 to January 20th 2019. However Paper I will be conducted in two shifts and Paper II will be conducted in one shift.